Get an inventory of the basic elements of classic car restoration work: engine work, bodywork, paintwork, and adding trim and moldings. Classic car restoration projects can quickly become obsessions. Purchasing a vehicle that requires restoration is an excellent way of laying your hands on a classic car and there are a large number of tasks that can be carried out without the need for professional help. It is highly unlikely that your restoration project will arrive with a fully-working engine. As with any other form of vehicle restoration, the true enthusiast will want every aspect of the vehicle looking as original as possible. The market for classic cars offers a number of alternatives for this and there are a large number of parts dealers that specialize in providing original parts for this type of vehicle. These dealers can be easily located in specialist classic car magazines or on the Internet. As an alternative, there are now companies that supply patterned engine parts for classic cars with the original company branding marks already added. This gives the impression of new parts being completely original and serves to create an authentic feel on your classic car. One of the biggest tasks you are likely to encounter during any restoration project is the bodywork. As well as having to deal with the usual array of dents and scratches, it is also very likely that vulnerable areas of the classic car will be the victim of corrosion. Although it is entirely possible to use acidic rust treatments on small areas, larger areas of metal corrosion need to be removed so that new metal plates can be welded in. This is particularly common around wheel arches and along sill panels and requires a high level of skill. Dents should be removed as much as possible using a flip, hammer and dolly. Any remaining depressions should be rectified with body filler. The great thing about body filler is that it can be easily rubbed out so that more can be added if you get the shape slightly wrong while sanding. Only the most adventurous classic car restoration enthusiasts should try to paint the vehicle themselves. Any finishing touches to body repairs and the entire paint job should be passed into the hands of a professional paint sprayer. Always aim to keep colors original when completing a restoration project. As well as preserving the spirit and appearance of your classic car, it will also help your project retain its value in the event of any subsequent sale. 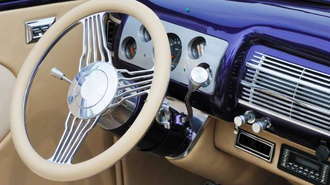 Always use original trim and moldings to give your classic car that perfect finishing touch. Headlamp surrounds, door handles, badges and fenders all add to the final appearance, but keeping trim as original as possible will not always be easy. Although magazines and the Internet will undoubtedly find you a few spares, one of the best places to find trim and moldings for your classic car is at specialist shows held on a regular basis throughout the country. Classic car enthusiasts use these shows to pick up a few cosmetic bargains. Because everybody present has a vested interest in restoration work, the chances of getting ripped off are pretty remote. Take a realistic approach and a holistic view before you embark on the project of restoring the antique car. Shop around, do research and prepare a realistic budget over time to bring about a positive result. The most important thing to keep in mind when it comes to car restoration DIY projects is that very few things will really be as simple as you think they will. When you are preparing for the restoration, a well thought out plan of attack is the best approach. Do a thorough inspection, taking notes, going over the vehicle one section at a time. Take stock of the condition of the body parts, interior, electrical, engine, exhaust, suspension and frame. Antique car restoration is a big task. To avoid getting bogged down with lots of work, create short term tasks and strive to complete them within the deadlines you set. Begin with what you know the best. There will be situations when you need to hire professionals to get the work done. This will obviously save you time, but it will also save money. Multiple attempts to complete a task you are not up for will cost you more and more. Make a list of such elements and get estimates from more than one person so you can get the best deal. Once you have a plan of attack, start any disassembling that needs to happen. For some, this will be a complete tear down of the vehicle, bolt by bolt, to the frame. Regardless of the level of tear down, take a detailed inventory of all parts that need some kind of work. As they are removed from the vehicle, write them down and note if they are to be repaired or replaced. Take photographs, keep detailed notes and index the items. Working in the same order in which you've already made notes on the different sections of the car will help keep you organized. You will need these lists later when you are ready to start ordering parts. If you personally do not know another car enthusiast, don't be afraid. Today, access to all kinds of information has been revolutionized with the Internet. You will find loads of information ranging from varieties of cars, their parts, where to find them and how to fix them online. There are books and magazines as well that can be of great help to you on this subject. As you begin the restoration work, three things hold the key to success: be organized, be patient and be knowledgeable. Take small steps to avoid frustration and remain motivated. If you wish to complete your car restoration project without spending a lot of money, follow the tips below. To begin, look for a vehicle that can be easily repaired. Contact various salvage car dealers and junk yards to find a vehicle that suits your budget and preference. Buying the cheapest salvage vehicle isn't the best idea. If the vehicle has a severely damaged frame, or if the vehicle is extremely rusted, you will incur additional expenses to get it restored. In order to avoid such hassles, have the car inspected by a trained mechanic so that you know if it's really worth buying and restoring. A vehicle that has been partly restored may be easier to work with. Look at all your options and join online car forums to find out if anyone has a project car for sale. After you've purchased the vehicle, look for automobile spares and parts online. There are several auto parts wholesalers online, who will sell you car parts at discounted rates. You could also contact junk yards to get replacement parts for cheap. Consider using aftermarket car parts particularly for car hoses and belts. This will significantly lower the cost of your restoration project. Some good websites to research include CheapAutoParts.com and Car Parts Wholesale. You can also find step by step guides, to auto restoration and repair. The key to completing a car restoration project on a budget is to carry out the repairs on your own. Although you may have to learn a lot about the entire process as you go, you can look for free online tutorials and do-it-yourself techniques to help you out. If you feel that any given task is too difficult to accomplish on your own, ask friends to assist you. Different steps in the process require different tools. Get the tools you need for each step as the need arises and buy nothing that isn't essential. You can also look for online deals when shopping for specific tools such as grinders and welders. Compare the price offered by several hardware shops, in order to take advantage of the lowest price. Use tried and tested techniques to clean parts and bolts. This will not only prevent you from purchasing unnecessary replacement parts but also increase the re-sale value of your vehicle. The bottom line is not to rush the project. You have been dreaming of this car, probably for a good amount of time. If you approach the restoration thoughtfully and with some planning, you will achieve the shining dream that you have for the car. What Are the Most Popular Antique Restoration Supplies for Restoring Cars? There are a number of antique restoration supplies that you're going to need if you plan on breathing new life into that antique car. Items such as wrenches, jacks and jackstands are obvious tools that you're going to need. However, items such as plenty of welding supplies, gas and wires are things that are sometimes overlooked. But if the car body has spots that are rusted through, you're going to need to weld in patches. Wire brushes, both hand and drill or grinder type, are other supplies that are often forgotten. Restoration supplies that every shop and garage have is a fully stocked detail kit with wash, wax and polish supplies. Where Can I Find a Classic Car Parts Catalog? You need a classic car parts catalog for your muscle car restoration project. Your problem is that you don't know where to find one. For classic American muscle cars, there are two excellent catalogs that you can obtain. No matter which make of car you have, Year One (1-800-YEAR-ONE) has a catalog that will contain just about any classic car part you need. If you have a Classic Chevy from the Fifties, then ClassicChevy is the catalog you need. For everyone else, whether it be Mustang, Camaro, GTO, or Mopar product, Classic Industries has a catalog for you. If you have a classic Mopar, Dantes has a catalog for you.